It's pretty clear that Alice has sucessfully rekindled the fire that made him great in the 70s. His latest release, Dirty Diamonds, is classic Alice the likes of which we haven't seen since 1976. I was stoked when I heard that Alice would be rolling through my neighbourhood in support of Dirty Diamonds. Man, I had butterflies in my stomach all day while I waited to go pick up Trash and head to Kingston at the appointed time. There's something about Alice..... The living legend status? The jaw droppingly talented band? The fact that I was gonna get to photograph the show? This was to be Trash's twelfth time seeing Alice. He is my Alice Cooper pimp. From December 1989 through today, I haven't seen Alice without Trash. This cat loves Alice, and that makes the shows even better. We hit Kingston about 7 pm and picked up our tickets and my photo pass. Second row, just off centre... not bad. We then settled in to watch the opening act. I knew nothing about The Sins. Their generic name made it tough to figure which of the multitude of bands called "The Sins" would be opening tonight. We were pleasantly surprised. The Montreal-based quintet was tight and put on a good show. The singer, Sindy, is a good looking girl, but her vocal chops are what kept me interested. The lead guitarist, Plear, was also a pleasure to listen to. The Sins play guitar driven hard rock with some catchy hooks. Trash picked up one of their demo CDs for me, and I'm rocking to it as I write this. I was herded into the photo pit just before 9:15. Four songs and 300 photos later I'm herded out of the pit. But, I have a ticket. While the other photographers are escorted from the building, I'm free to head back to my seat. Pretty soon, I give up on ever getting back to the second row. The closer I get to the front the more dirty looks I get and the more firmly people start planting themselves in my way. 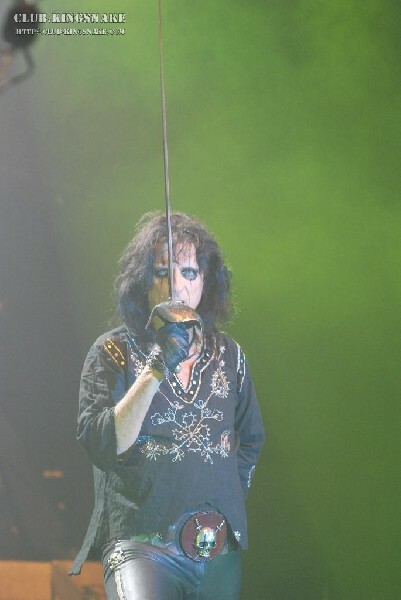 Alice Cooper's road manager had given me the go ahead to take shots during the rest of the show, so I found a comfy spot and snapped another few hundred shots while Alice set about putting on one the best rock shows I've ever been to. Alice played all the classics as well as several songs from recent albums. "Only Women Bleed," "Billion Dollar Babies," "Stephen," "Welcome to my Nightmare," "School's Out," "Poison," and "Dirty Diamonds" were all on the setlist. The real treat was the inclusion of "You Drive me Nervous" (Killer, 1971), "Guilty" (Goes to Hell, 1976), "I Never Cry" (Goes to Hell, 1976) and "Wish I Were Born in Beverly Hills" (From the Inside, 1978) . In his dozen Cooper experiences, Trash had never heard these songs live. 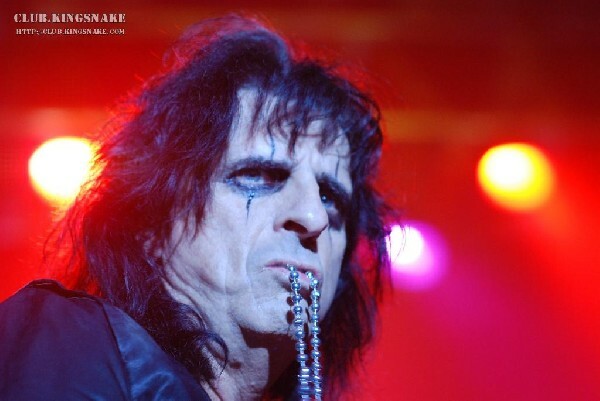 I also must give a tip of the hat to the Alice Cooper Band. Alice always has a vibrant band that never fails to breath new life into what are often decades-old songs. Chuck Garric has been a mainstay on bass for several years, Damon Johnson has moved over to the lead guitar slot since last I saw Alice, Keri Kelli, who has played with the likes of Slash's Snake Pit and Vince Neil, is now occupying the rhythm guitar slot vacated by Damon. Rock and roll icon Eric Singer (Kiss, Black Sabbath, Gilby Clarke) rounds out the band on drums. The stage show was lean and mean with just the minimum of trademark Alice. The crutch, the straight jacket, the sword, and the guillotine gave the diehards what they expected, but kept things from being too campy. Alice's brand of "Shock Rock" is alive and well, and the chief purveyor was in fine form tonight in Kingston. i went to your concert it was the best i have ever saw.it was raw.